Middle school and high school years are hard. They are full of uncertainty – about where to sit at lunch, why their bodies are changing, who likes them, and how to navigate these awkward teen years. And what about parenting?! It is full of questioning your own parenting tactics and their success on top of wondering if you can trust anything that is coming from that child’s mouth. Take all of these insecurities, add a jaded filter, and you have a complete and utter mess. What do I mean by a jaded filter? Everyone comes into a situation with a set perspective (or filter). We refer to rose colored glasses. We ask if people see the glass as half empty or half full. We bring our backgrounds, ideas, past experiences, optimism, pessimism, trust issues, and more into every single conversation. And that can change everything. If you have seen The Sound of Music, you know that it is the opposite of a horror movie. But when you change the background music and take scenes out of context, it can take a completely different tone. The same is true of our conversations. If we have in our mind that a conversation is going to be negative, we will see it through that light. If we pull every bad interaction out of context, we will only see that relationship through that lens. But our filters also have the power to improve situations – like if we assumed the best before starting a discussion. Or remembering all the good things that our teenagers have done instead of focusing on the bad. Are you putting unfair expectations on a conversation? Where do these expectations come from? Is there an unrelated, bad experience from earlier in the day that could affect a confrontation with your teen? Address your teen’s filter. Just like you are coming into the conversation with a filter, so is your teenager. Maybe something happened last week that has made them angry at you. Maybe something happened at school to put them on the defensive. Maybe a different adult relationship has made them distrustful. In order to have a neutral discussion, you also have to address their filter. Ask them similar questions as the ones above. Clear the air and be ready to listen in order to find out about their perspective. Be open and address that there could be something that is affecting the conversation. Apologize if there is something that happened earlier to impact their filter. Ask how your teen’s day has been before you jump into a conversation. Remember the things you love about each other before starting the discussion – focus on the good memories! 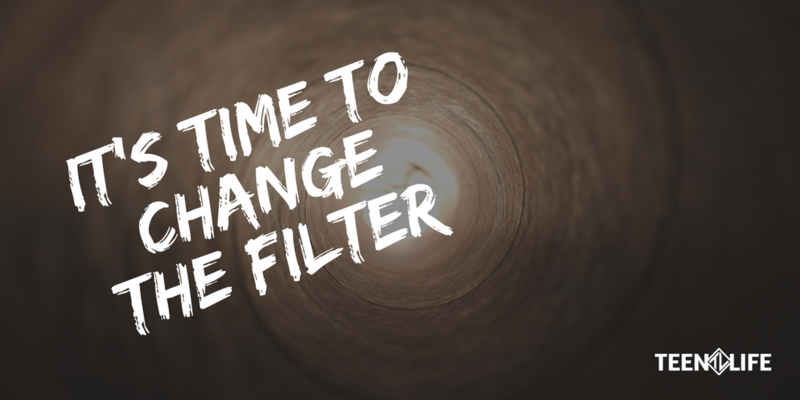 Let’s change our filters and have positive conversations with teens – no more horror filters, disrespect filters, anger filters, or disappointment filters. Each interaction can be a fresh start and a learning experience. How have you seen filters impact your own conversations? What others tactics can we use to change our filters? Share your ideas! !